With over 100 excellent games on offer, Lincoln Casino is an alluring gambling destination for many entertainment seekers out there. Tournaments, regular bonuses, comp points and promotions, coupled with a quick customer support team – these are what make the casino a truly comfortable place that provides an unmatched level of privacy, care and service. Lincoln Casino welcomes gamblers from all over the world, including U.S. residents. The casino is compatible with all types of mobile devices and operating systems and offers a mobile-optimized version of their website on a subdomain. 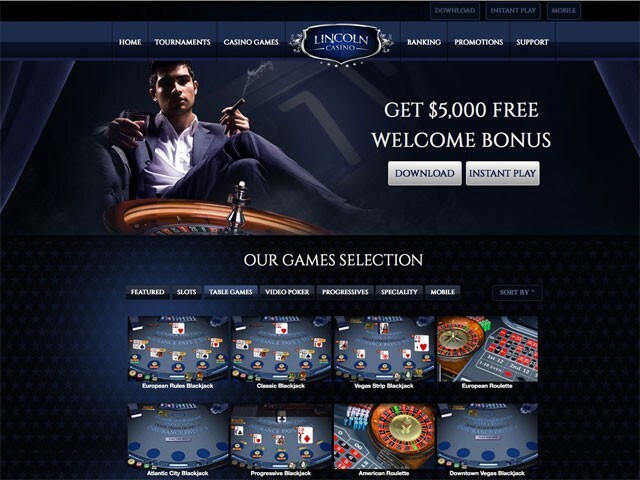 Lincoln Casino is available for play both directly on a browser or via a downloadable app that should be installed on a user’s device. Players from the USA are entitled to register and place bets, yet there are some residence-based restrictions. The minimum amount that can be cashed out from the casino is $150 per transaction, and the maximum amount is set at $5000 per week. To play at the casino for real money or free, a user needs to open an account first. The casino operates on the WGS software that delivers high quality gaming solutions, including roulette games. Players at Lincoln Casino can enjoy European and American roulette variants that use the classic rules and bet types one can find at most land-based casinos. The games have a traditional table markup for inside and outside bets (no neighbor bets are available): all even money bets, dozen bets, column bets, etc. For a more comfortable gameplay, both roulette variants feature History Window, Clear and Rebet buttons, and some expert options. American roulette. This has a single and a double zero pockets. An extra green pocket increases the house edge to 5.26%. The casino is jam-packed with bonuses, promotions, scheduled tournaments and other events that add variety and fun to a gameplay. Although wagers on roulette games qualify 0% towards minimum WRs for most bonuses, roulette enthusiasts can still benefit from some of the bonuses and events at the casino. Lincoln Casino runs an enormous number of daily, weekly and monthly tournaments with big prize pools. Besides, every player can earn comp points betting in roulette games, and then exchange them for real money.